Following on from Maximum Crisis, Pendulum Evolution features powerful new Pendulum Monsters that can either stand on their own or in the service of that dreaded dragon, the Dominator of Dimensions itself, Supreme King Z-ARC! All-foil set, each pack includes a mix of Ultra Rare and Super Rare cards. Compatible with the Pendulum Monsters you already own, but specially crafted to take advantage of Maximum Crisis. Includes a pair of super-powered Sorcerers that are easy to Summon and give a faster, easier way to bring out Supreme King Z-ARC. New “Magician” monsters that excel at disappearing acts, providing useful effects when destroyed before moving to your Extra Deck to be Pendulum Summoned back for the grand finale! Features several new cards plus dozens of the most popular cards from the Pendulum Monster era of the Yu-Gi-Oh! ARC-V animated TV series. 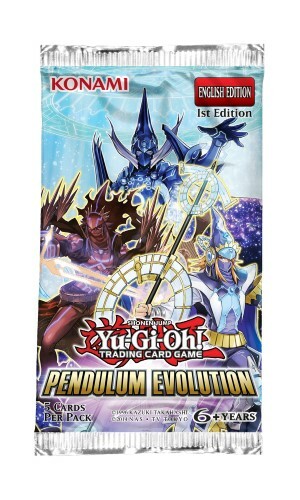 • The Pendulum Evolution booster set contains 60 cards: 50 Super Rares and 10 Ultra Rares.